First up is the Sherwood, which coordinates with one of our existing Baby Shower stationery suites. Featuring folk-art inspired forest creatures, this whimsical design can be adapted in any color palette and includes an appliqued photograph of the little one. Adorable matching graphics may be printed on the envelopes as an optional Addressing add-on. The Neverland suite features a wee enclosed photo mounted beside flat printed modern typography introducing baby to the world. The cardstock enclosure is held shut with a die-cut sticker monogram that matches the envelopes (available in any color.) Coordinating wrap-around address labels are also available. With a graphic take on preppy, Liliput features a colorful Argyle pattern surrounding a portrait flat printed on a soft, textured matte cardstock. Clean, modern typography introduces the new addition. Coordinating banner-shaped return address labels and fill-in recipient labels are included. Avalon showcases sophisticated typography complimented by soft stripes and natural kraft envelopes. The Announcement features a photo and text flat printed on a soft, lightly textured matte cardstock and an additional, frame-able 4x6" photo insert is optionally available to extend the suite. The extended version includes a baker’s twine embellishment to hold the elements together and addressing may be added with matching address labels and a flat printed back-flap return address. You can see more photos of each of these suites in the Baby section of our portfolio. For pricing, other info and to place an order, contact us. We would be honored to help you introduce your new arrival to the world in print! 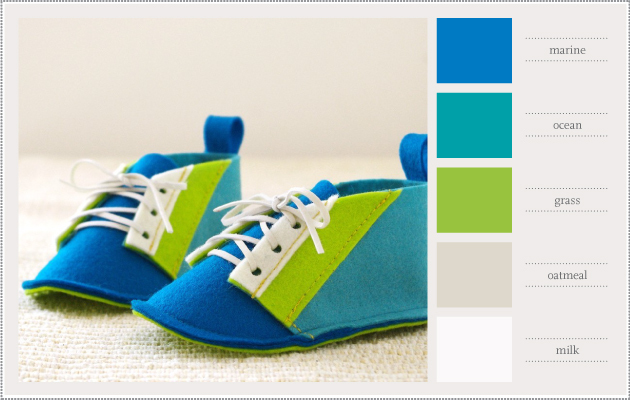 I supposed I still have felt on the brain this week because today's color palette is inspired by these adorable felt baby shoes. With so many friends starting to have babies, I certainly have these (as well as many other items in the La La Shoes shop) in mind as future gifts.